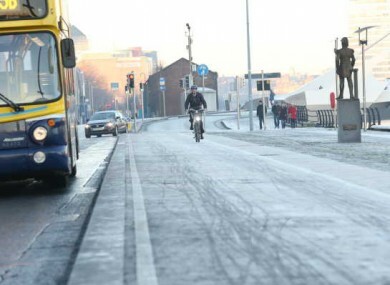 File picture of icy conditions in Dublin city centre. IT’S GOING TO be a cold, wet, windy start to the weekend, with temperatures expected to plummet to -3C tomorrow night. Transport Infrastructure Ireland have warned that road temperatures remain low this morning, with ice across many routes and snow and ice reported last night on the M7, according to AA Roadwatch. After yesterday’s smattering of snow in the capital, today will see thundery downpours across the country, with some also turning decidedly wintry. Temperatures will be as low as 4C, although the sun is expected to make intermittent cameo appearances either side of windy downpours. There’s going to be a widespread frost tonight, too, with snow expected in the west and north, according to Met Éireann. Showery with heavy or thundery downpours,some wintry, esp in W & N.Cold with maximum temperatures 4-8C in blustery W to NWerly winds. The good news from Met Éireann is that tomorrow will be mostly dry for most people – unless you live on the west or north-west coast. The showers are expected to taper off tomorrow across most of the country, but it will stay very cold, with temperatures dropping to between -3C and +1C tomorrow night. The downpours will return tomorrow night, meanwhile, with sleet expected on the south and southeast coast, but Sunday is expected to be cold and dry. The cold snap is expected to continue into next week, with scattered showers expected on Monday and Tuesday. Road Temps are lower then they have been this morning with possible ground frost or ICE, please drive with extreme care on all routs. Email “Thundery downpours forecast today - and it'll be freezing this weekend”. Feedback on “Thundery downpours forecast today - and it'll be freezing this weekend”.